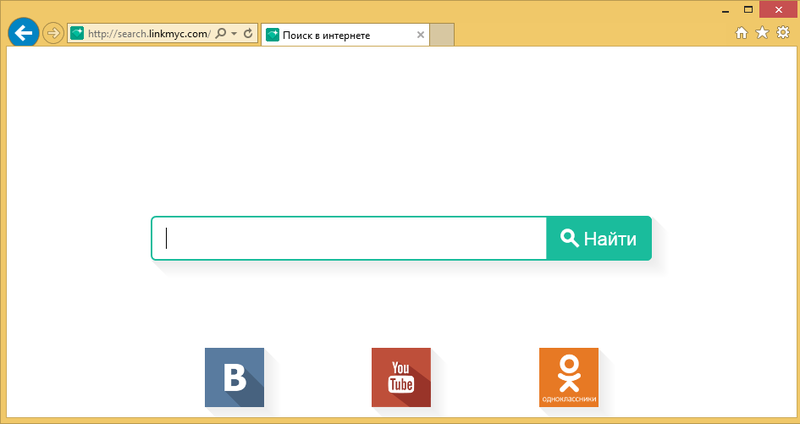 Search.linkmyc.com is a browser hijacker aimed at Russian-speaking computer users. It may seem just like any other search portal, however, it is actually used to make profit. The developers of the hijacker earn revenue each time you click on the ads that they expose you to. Whatever useful functionality that the hijacker claims to have, it is nothing compared to the disruptions that it causes on a daily basis. It not only alters your browser settings, but also inserts ads into all pages that you visit, causes redirects to unfamiliar sites, slows down your browsing and your computer speed, and more. There is no question that you should get rid of Search.linkmyc.com without further delay. Although Search.linkmyc.com is targeted towards Russian users, that does not mean that it cannot enter your system, if you live in a different country. The hijacker uses the bundling distribution method, which means that it gets attached to free third party software. When you install the software, the hijacker is presented to you as an additional offer. Unless you specifically decline it, it gets installed automatically. If you want to avoid potentially unwanted apps in the future, you should pay more attention to the installation wizard of the freeware that you download. Once inside, the hijacker changes your home page and default search engine to Search.linkmyc.com. The page contains a search box and quick access links to such sites as VK, YouTube, Aliexpress, and Ok.ru. If you enter a term into the search box, you will get rerouted to Go.mail.ru and get results that will include sponsored links. You may also get redirected to the Mail.ru site for no apparent reason. Moreover, the hijacker will insert various ads into your browsers, some of which may lead you to unreliable domains. That is why we advise that you avoid all ads and do not hesitate with Search.linkmyc.com removal. There are two ways you can delete Search.linkmyc.com from your browsers: manually or automatically. Automatic removal is certainly the more effective option as it allows you to not only erase Search.linkmyc.com, but also make sure that there are no other unwanted components on your PC. If you use the malware remover from our site, it will clean your system from all threats that it detects and it will keep your computer safeguarded from other online parasites that may try to infiltrate it. The alternative removal method is manual. In order to eliminate Search.linkmyc.com manually, you will have to uninstall its related program first and then restore your browser settings. Instructions on how to complete these tasks and thus terminate Search.linkmyc.com for good are presented right below the article and you are welcome to use them.